2003-06-13 Assigned to PROXIM, INC. reassignment PROXIM, INC. ASSIGNMENT OF ASSIGNORS INTEREST (SEE DOCUMENT FOR DETAILS). Assignors: NBAND COMMUNICATIONS, INC.
2003-06-20 Assigned to PROXIM, INC. reassignment PROXIM, INC. ASSIGNMENT OF ASSIGNORS INTEREST (SEE DOCUMENT FOR DETAILS). Assignors: NBAND COMMUNICATIONS, INC.
2003-10-03 Assigned to PROXIM WIRELESS NETWORKS, INC. reassignment PROXIM WIRELESS NETWORKS, INC. CHANGE OF NAME (SEE DOCUMENT FOR DETAILS). Assignors: PROXIM, INC.
2003-10-14 Assigned to PROXIM CORPORATION reassignment PROXIM CORPORATION ASSIGNMENT OF ASSIGNORS INTEREST (SEE DOCUMENT FOR DETAILS). Assignors: PROXIM WIRELESS NETWORKS, INC.
2004-08-03 Assigned to PROXIM CORPORATION reassignment PROXIM CORPORATION RELEASE OF SECURITY AGREEMENT Assignors: WARBURG PINCUS PRIVATE EQUITY VIII, L.P.
2006-02-27 Assigned to STUN ACQUISITION CORPORATION reassignment STUN ACQUISITION CORPORATION ASSIGNMENT OF ASSIGNORS INTEREST (SEE DOCUMENT FOR DETAILS). Assignors: PROXIM CORPORATION, PROXIM INTERNATIONAL HOLDINGS, INC., PROXIM WIRELESS NETWORKS, INC.
2008-05-07 Assigned to PROXIM WIRELESS CORPORATION F/K/A PROXIM CORPORATION reassignment PROXIM WIRELESS CORPORATION F/K/A PROXIM CORPORATION RELEASE BY SECURED PARTY (SEE DOCUMENT FOR DETAILS). Assignors: WARBURG PINCUS PRIVATE EQUITY VIII, L.P.
2009-05-19 Assigned to PROXIM WIRELESS CORPORATION F/K/A PROXIM CORPORATION reassignment PROXIM WIRELESS CORPORATION F/K/A PROXIM CORPORATION RELEASE BY SECURED PARTY (SEE DOCUMENT FOR DETAILS). Assignors: WARBURG PINCUS PRIVATE EQUITY VIII, L.P.
Orthogonal frequency division multiplexing (OFDM) receiver embodiments of the invention demodulate quadrature amplitude modulated (QAM) signals transmitted in the five GHz frequency band and digitally correct for frequency offset errors in their digital signal processing (DSP) units. A method comprises a step in which an OFDM transmission is I/Q sampled and a portion of the received packet is selected. It is assumed that the coarse frequency offset has been estimated and that the remaining frequency offset after coarse frequency offset compensation does not exceed ±10 kHz (valid for 802.11a PHY implementation only). It is also assumed that a timing reference has been determined. A cost function is used to determine a fine-frequency offset. Once the fine frequency offset is determined, the estimate is used in the downstream digital signal processing. Orthogonal frequency division multiplexing (OFDM) receiver embodiments of the invention demodulate OFDM signals (embedding quadrature amplitude modulated (QAM) signals) transmitted in the 5 GHz frequency band and digitally correct for frequency offset in their digital signal processing (DSP) units. These include binary phase shift keying (BPSK), quadrature phase shift keying (QPSK), 16-QAM and 64-QAM (and 256-QAM in future standard enhancements). The method assumes that the coarse frequency offset value has already been estimated using the first part of the preamble (also referred to as short preamble) and that the second part of the preamble (also referred to as long preamble), which is subsequently used for fine frequency offset estimation, has been frequency offset corrected accordingly. It is also assumed that the boundary between short and long preambles has been precisely determined. A presently preferred method comprises a step in which an OFDM signal is I/Q sampled. The minimization of a cost function provides the fine frequency offset value. Once this value is available, it is used in the downstream digital signal processing. FIG. 3 is a flowchart of a method embodiment of the invention for determining the fine-frequency offset error from samples obtained during the long-preamble interval in the structure of FIG. 2. FIG. 1 illustrates a wireless local area network (LAN) embodiment of the invention, and is referred to herein by the general reference numeral  100. Such wireless LAN is preferably based on orthogonal frequency division multiplexing (OFDM), and quadrature phase shift keying (QAM) of signals transmitted in the license-free 5 GHz frequency band. The wireless LAN  100 typically includes a wireless network 101 connected to the Internet, a PHY-transmitter 102, and a PHY-receiver 103. Such units all conform to the IEEE-802.11a specification for a physical layer (PHY) interface in a wireless local area network which allows mobile clients. The transmitter 102 comprises a digital signal processor (DSP) 104 which implements a forward error correction (FEC) coder 106, an interleaving and mapping process 108, an inverse fast Fourier transform processor 110, and a symbol wave shaper 112. The DSP 104 outputs in-phase (I) and quadrature-phase (Q) signals that are input to an IQ modulator 114 driven by a local oscillator 116. The modulated output is sent to a mixer 118 for upconversion to the 5 GHz band. A second local oscillator 120 provides the necessary carrier frequency. A high power amplifier (HPA) 122 drives a transmitter antenna 124. A radio up-link 125 is received by the wireless network 101. In general, the transmitter 102 can be implemented with conventional methods and components. The receiver  103 receives a radio down-link 126 that is typically transmitted in bursts. Each packet is begun with a training sequence, e.g. a short and long preamble. The receiver 103 includes a receiver antenna 128 followed by a low-noise amplifier (LNA) 130. A local oscillator 132 and a first mixer 134 produce an intermediate frequency (IF). An automatic gain control (AGC) amplifier 136 smoothes out signal-strength variations and drives an IQ-detector 138. A second local oscillator 140 provides the carrier necessary to derive the l/Q samples, e.g. 16-bit binary at 20.0 MHz. In all presently preferred embodiments of the invention, no automatic frequency control (AFC) clock recovery is needed because any frequency offset are corrected in later digital processing. A receiver-DSP 142 comprises a fast Fourier transform process 144, a demapping and deinterleaving process 146, and an FEC decoder 148. The receiver-DSP 142 further includes the necessary digital logic needed for carrier frequency offset determination and correction. The higher levels of the mobile client are represented by a media access controller (MAC)  150 and a client agent software 152. The fine-frequency offset can be computed once the coarse frequency offset and synchronization, i.e. accurate determination of the boundary between short and long preambles has been determined. FIG. 2 illustrates a burst transmission structure  300 that begins with a short preamble 302 followed by a long preamble 304. A boundary 306 serves as an important timing point, and previous circuitry must find this point in transmission time before fine-frequency offset determination can proceed. Each of the short preamble 302 and long preamble 304 periods are 8.0 μs long. The long preamble begins with a guard interval (GI) that is two 0.8 μs units long. Each long symbol, T1 and T2, is 3.2 μs in transmission duration. An algorithm similar to the well known multiple signal classification (MUSIC) is used in an embodiment of the invention. This algorithm is specifically applied to a selected portion of the long preamble. Please note that the length of the processed signal must be a multiple of 64 samples (when the sampling frequency is 20 MHz) since the basic constituent of the long preamble is generated from a 64-element sequence. This leaves us with two possibilities: we can choose to process either T 1 or T2 (3.2 microsecond=64 samples), either the sequence T3 encompassing both T1 and T2 (6.4 microsecond=128 samples). The timing knowledge, i.e. the knowledge of the boundary between short and long preambles, needed to extract either sequence is a direct result of the synchronization stage. From a performance standpoint, it is of course better to work on T3. The length of the processed signal determines the dimension of the vector space dealt with. This vector space can be decomposed into two orthogonal subspaces: a signal and a non-signal subspaces. where N is the dimension of the eigenvectors and v k is the k-th eigenvector of the correlation matrix. The integer p is the dimension of the signal subspace, so the eigenvectors vk used in the sum correspond to the smallest eigenvalues and also span the noise subspace. 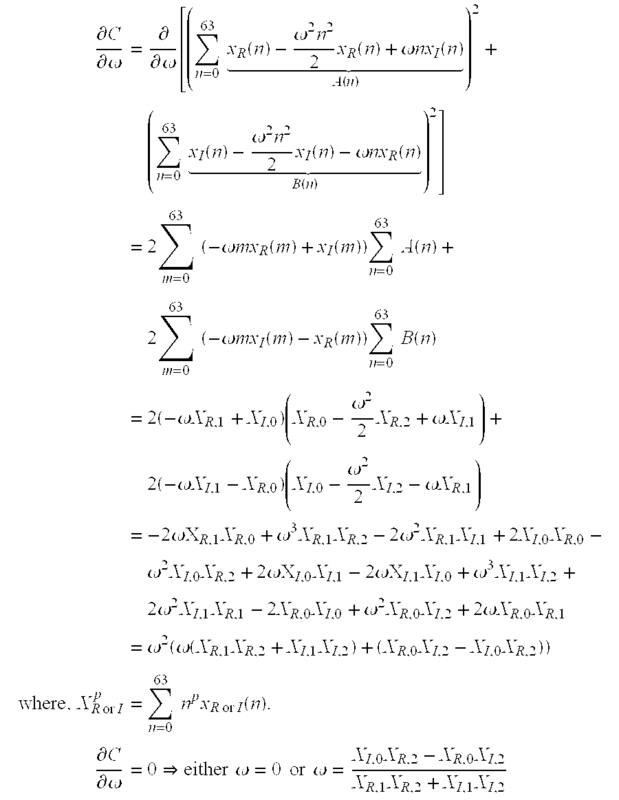 The vector e(f) consists of complex exponentials, so the inner product νk He(ƒ) amounts to a Fourier transform. This is used for computation of the pseudospectrum estimate. The FFT is computed for each vk and then the squared magnitudes are summed. FIG. 3 represents a method embodiment of the invention, and is referred to herein by the general reference numeral  400. The method 400 comprises a step 402 in which an OFDM transmission is I/Q sampled. The measurements represent a reference signal comprising a signal subspace and a non-signal subspace (spectral representation). The reference signal includes fifty-two non-zero equal magnitude subcarriers. A step 406 assumes the coarse frequency offset after compensation does not exceed ±10 kHz. A step 408 uses a cost function to determine a fine-frequency offset. A step 410 compensates the fine-frequency offset. using a cost function to determine a fine-frequency offset of said OFDM radio transmission for use in a subsequent circuit providing for frequency compensation of any fine-frequency offset. determining a coarse frequency offset of said OFDM radio transmission. compensating any coarse frequency offset determined in a previous step to at worst approximately ±10 kHz. finding a timing reference boundary between a short preamble and said long preamble in said OFDM radio transmission. C  ( v ^ ) =  V 0  X v ^  2 =  ∑ n = 0 63   x  ( n )   - j2π  v ^ F s  n  2 . C  ( v ^ ) =  V 0  X v ^  2 =  ∑ n = 0 63  x  ( n )   -    2   π  v ^ F i  n  2 .